Seventeenth-century newsbooks differed from modern newspapers in both form and style, appearing as small pamphlets and ranging from four to forty pages in length. Although they generally focused on a single topic, they gave their readers detailed accounts of the same kinds of events that we read about in today's newspapers. The opening of the Long Parliament in November 1640, on the eve of the English Civil War, began a period of rapid change. The first newsbook containing domestic rather than foreign news began publication in November 1641. 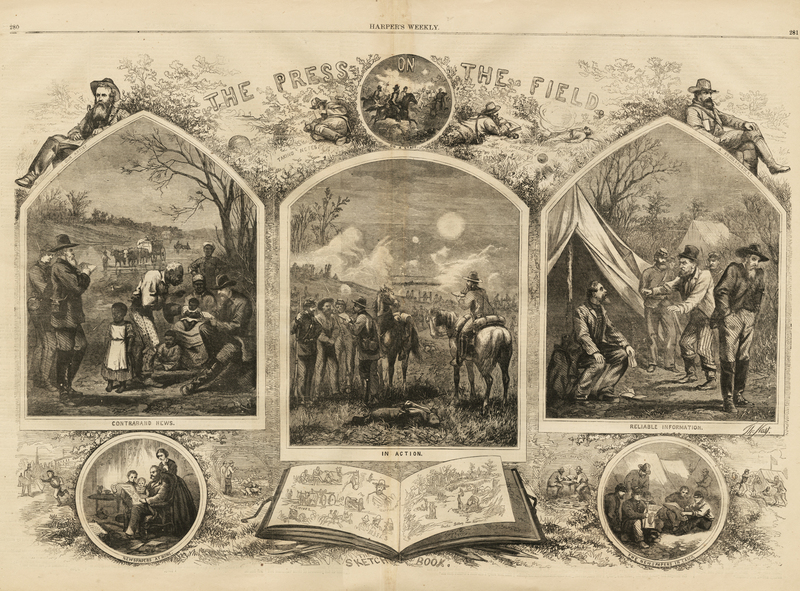 As the Civil War became more bitter, newsbooks were published to provide propaganda for each side. The desire for news was such during the Civil War and Commonwealth that during the 1640s and 1650s over 300 differently-titled newsbooks appeared, although most of them did not last. The newsbook page seen here recounts the beheading of Charles II following the English Civil War. 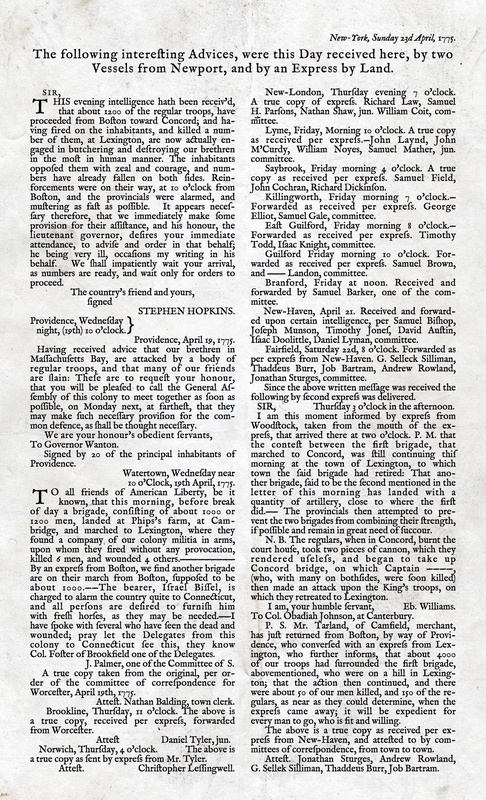 Publick Occurrences Both Forreign and Domestick was the first multi-page newspaper published in the Americas. Before then, single-page newspapers, called broadsides, were published in the English colonies and printed in Cambridge in 1689. The first edition was published September 25, 1690, in Boston and was intended to be published monthly, "or, if any Glut of Occurrences happen, oftener." It was printed by American Richard Pierce of Boston, and it was edited by Benjamin Harris, who had previously published a newspaper in London. No second edition was printed, as the paper was shut down by the government for seditious libel. At left is the official proclamation accusing Harris of seditious libel and effectively shutting down his newspaper. In 1733, a group of dissidents opposed to the regime of New York governor William Cosby asked printer Peter Zenger to publish a series of critical commentaries combined with a strong appeal to press freedom as a method of communicating such political criticism. The writer, one of the group of dissidents, used the pseudonym "Cato." The series ran on consecutive Mondays until angered authorities arrested Zinger for seditious libel. He was jailed for nearly three months while being tried, during which time his wife took on his printing and publishing concerns. He was ultimately acquitted by a jury, despite pressure from the judges and the governor. The New-England Courant is one of the oldest and the first truly independent American newspapers. It was founded in Boston on August 7, 1721 by James Franklin, Benjamin Franklin's older brother. The newspaper participated in several controversies and was suppressed in 1727. Although Ben Franklin started in the newspaper as a typesetter, he later wrote over a dozen articles under the fictitious name Silence Dogood. Besides political bravery, the Courant also made a number of innovations. 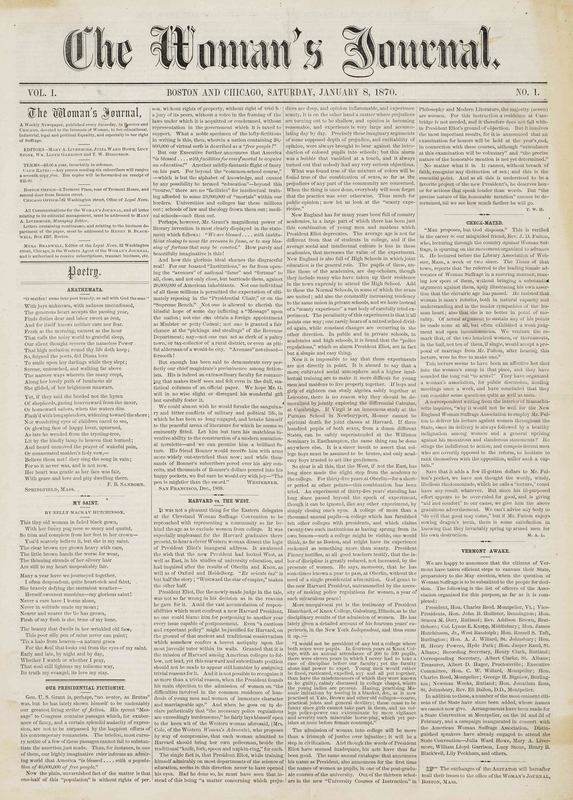 It was the first American newspaper to use literary content and humorous essays. It was also the most expensive newspaper of that time, at 4 pence a copy. First published on April 24, 1704, The Boston News-Letter is regarded as the first continuously published newspaper in British North America. It was heavily subsidized by the British government, with a limited circulation. The News-Letter’s first editor was John Campbell, a bookseller and postmaster of Boston. During its early years it was filled primarily with news from London journals describing English politics and the details of European wars. In the early years of its publication the News-Letter was filled mostly with news from London journals detailing the intrigues of English politics, and a variety of events concerning the European wars. The rest of the newspaper was filled with items listing ship arrivals, deaths, sermons, political appointments, fires, accidents and the like. Eventually, events in the Colonies began to supplant European news. One of the most sensational stories published when the News-Letter was the only newspaper in the colonies was the the account of how Blackbeard the pirate was killed in hand-to-hand combat on the deck of a sloop that had engaged his ship in battle. The Boston Gazette was first published in Boston on December 21, 1719 and appeared weekly. The paper was started as a rival to The Boston News-Letter. In 1741 the Boston Gazette incorporated the New-England Weekly Journal and became the Boston-Gazette, or New-England Weekly Journal. Contributors included Samuel Adams, Paul Revere, and Phyllis Wheatley. The paper's masthead vignette, produced by Paul Revere, shows a seated Britannia with Liberty cap on staff, freeing a bird from a cage. Motto: "Containing the freshest Advices, Foreign and Domestic." This reproduction of the coverage of the "Boston Massacre," March 12, 1770, uses exact text and a composite layout, including an image run after this issue as part of the notice of burial of those killed in the incident. 'Join, or Die,' one of the earliest published political cartoons, was created by Benjamin Franklin for his Pennsylvania Gazette on May 9, 1754. The original publication by the Gazette is the earliest known pictorial representation of colonial union produced by a British colonist in America. It is a woodcut showing a snake severed into eighths, with each segment labeled with the initials of a British American colony or region. New England was represented as one segment, rather than the four colonies it was at that time. In addition, Delaware and Georgia were omitted completely. Thus, it has 8 segments rather than 13, which would have represented the traditional 13 colonies. The cartoon appeared along with Franklin's editorial about the "disunited state" of the colonies, and helped make his point about the importance of colonial unity. The image was later used as the basis for the "Don't Tread on Me" slogan and symbol of colonial freedom during the American Revolutionary War. This is the original version of the broadside from the Library of Congress. There are torn areas in which portions of the text have been lost. This version is a recreation of the original with the missing text extrapolated from the context of the passages around it. Colonial printers of newspapers and almanacs often printed broadsides as a source of extra income, in addition to other jobbing work, and some printers sold books and stationery supplies as well. Essential late-breaking news was transmitted as broadside "Postscripts" or "Extras" to the weekly newspapers. The broadside here contains information on the battles of Lexington and Concord in April, 1775—breaking news at that time. There were three different papers published in Williamsburg under the name The Virginia Gazette between 1736 and 1780. The papers went through several publishers, mottos, and banners. It's worth noting that at least one woman, Clemintina Rind, published the Gazette after her husband died. The news generally covered Virginia and the other colonies as well as the political goings on in Europe—especially as it pertained to America. 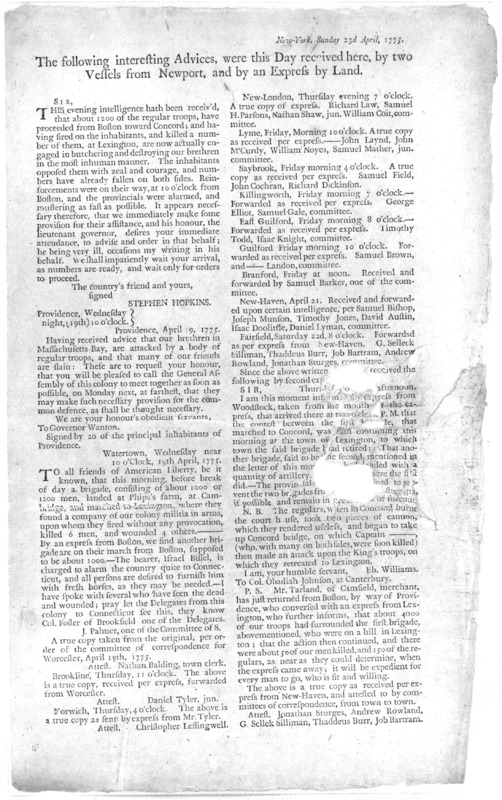 The two pages of a four-page Gazette shown here leads with news from Europe, hints at the growing rebellion in the Colonies, and recounts a recent battle in Boston—Bunker Hill, the first large-scale battle of the Revolutionary War. The National Thanksgiving Proclamation was the first formal proclamation of Thanksgiving in America. George Washington, the first President of the United States, made this proclamation on October 3, 1789, in New York City. 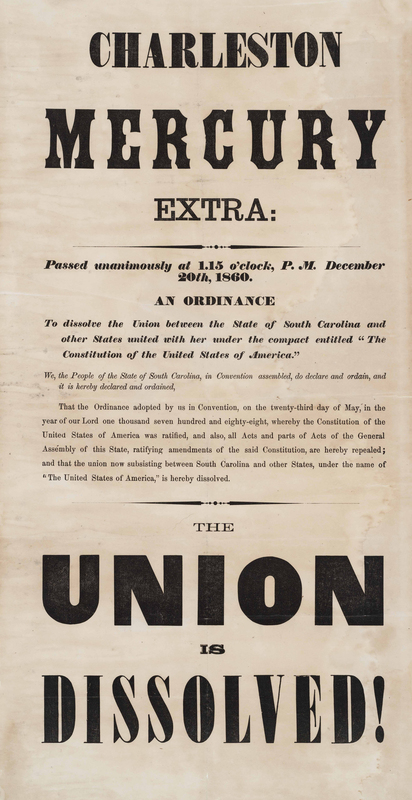 The initiative for the proclamation originally came from the House of Representatives, though support for the proclamation was hardly unanimous. Some representatives objected that such imitations of European practices would make a mockery of genuine expressions of prayer and thanksgiving, while others objected that expressions of gratitude are private matters that the federal government has no business mandating. Nevertheless, a majority favoring a presidential proclamation prevailed, and President Washington formally declared November 26 to "be devoted by the People of these States to the service of that great and glorious Being, who is the beneficent Author of all the good that was, that is, or that will be." (Wikipedia.com). The layout here is from transcribed text and not the original. It is worth noting that as far back as 1690, the first newspaper in the colonies, Publick Occurrences, (which was suppressed immediately) noted that, "The Christianized Indians in some parts of Plimouth, have newly appointed a day of Thanksgiving to God for his Mercy in supplying their extreme and pinching Necessities under their late want of Corn, & for His giving them now a prospect of a very Comfortable Harvest. Their Example may be worth Mentioning." No mention of their contribution to this holiday appeared in Washington's proclamation. Visit the Newseum online at: http://www.newseum.org. 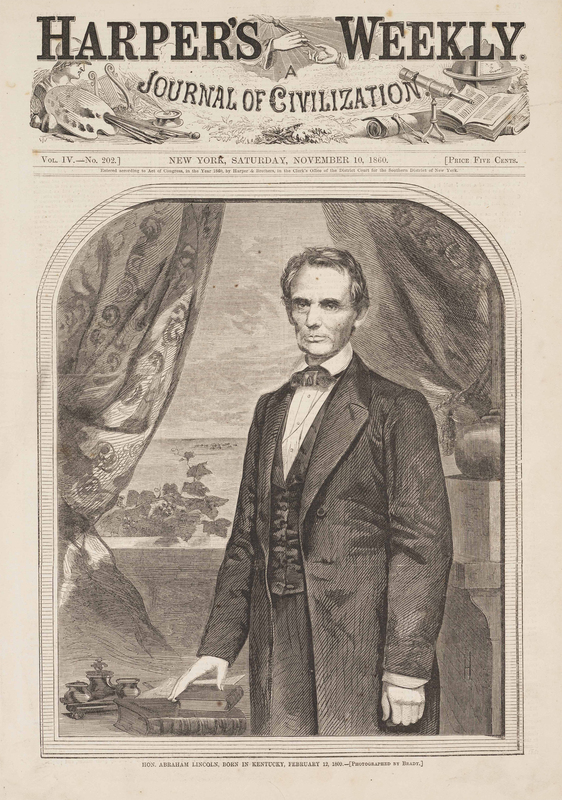 Harper's Weekly based this 1860 inaugural illustration of Lincoln on a photograph by Mathew Brady, the portrait photographer who documented the Civil War and paved the way for photojournalism. Until the 1870s, newspapers lacked the technology to publish photos. To create illustrations such as this one of Lincoln, artisans carved "woodcut" designs into blocks of wood, which were then set with the rest of the page type for printing. 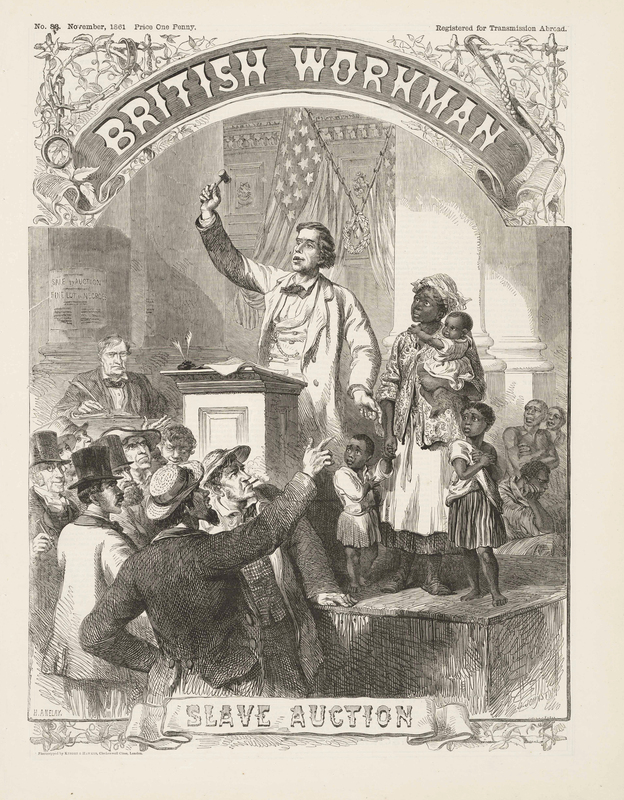 This British Workman, published in London in 1861, depicts an American slave auction. Shackles and a whip appear at the top corners of the front page, and an inside story urges readers to pray that the "dark stain of slavery" be "forever wiped away." This "extra" edition of the Charleston Mercury trumpets the news that South Carolina seceded from the Union on Dec. 20, 1860. In the six months that followed, 10 other Southern states joined South Carolina in secession. Together they formed the Confederate States of America. These are some of the many newspapers featured in the Newseum's digital classroom exhibit, "Marching for Women's Rights." Few newspapers covered the suffrage movement, so suffragists produced their own. 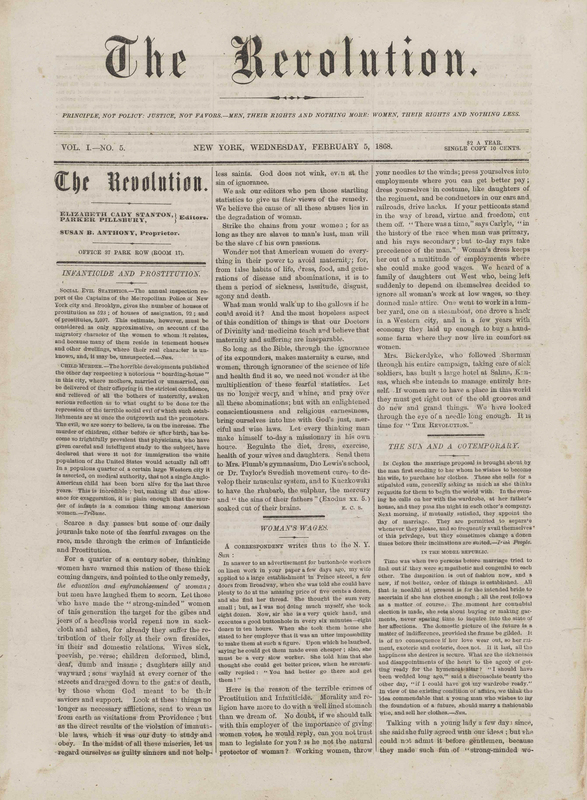 Susan B. Anthony and Elizabeth Cady Stanton founded the radical weekly The Revolution in 1868. This is the first issue of The Woman's Journal, founded by the American Woman Suffrage Association in 1870. 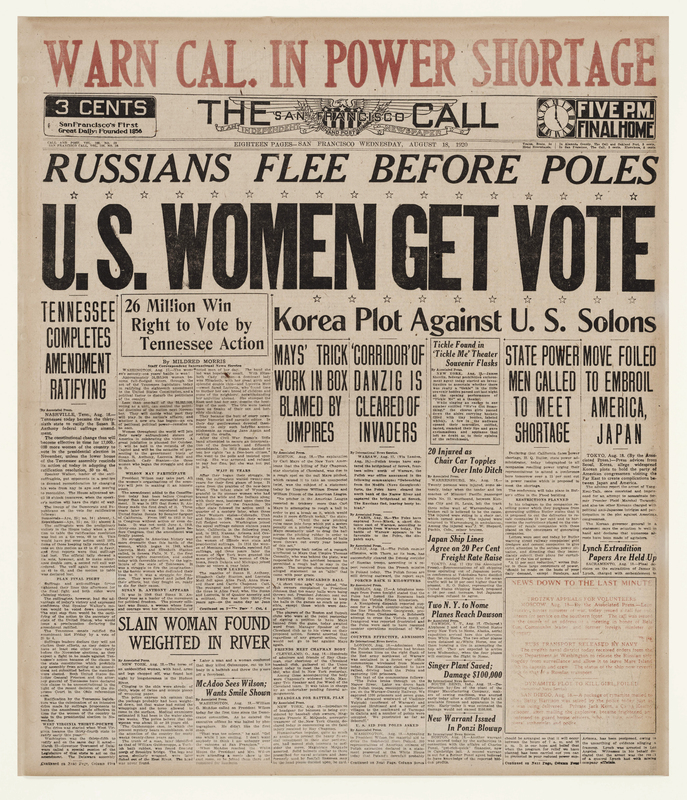 The newspaper became the suffrage movement's leading publication. Starting with Wyoming in 1869, Western states and territories led the way in granting women the right to vote. 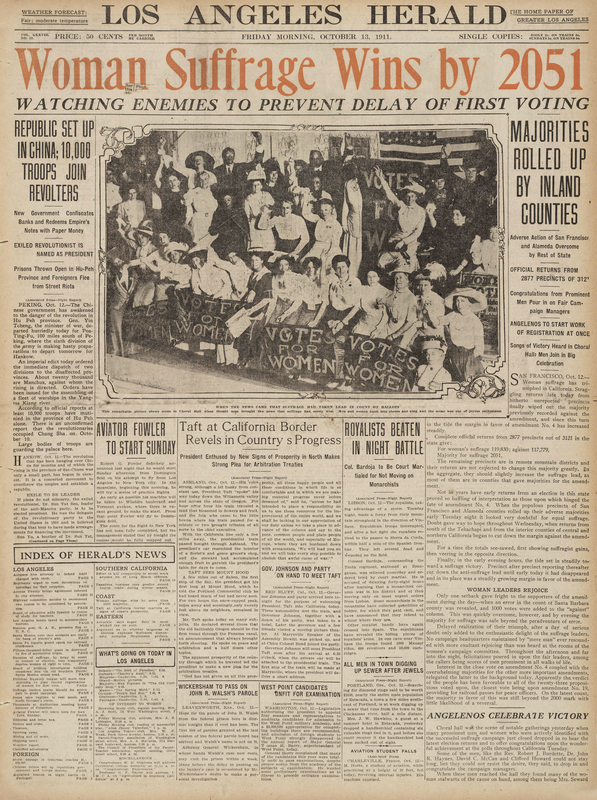 The Los Angeles Herald trumpeted California's vote with a red banner headline in 1911. 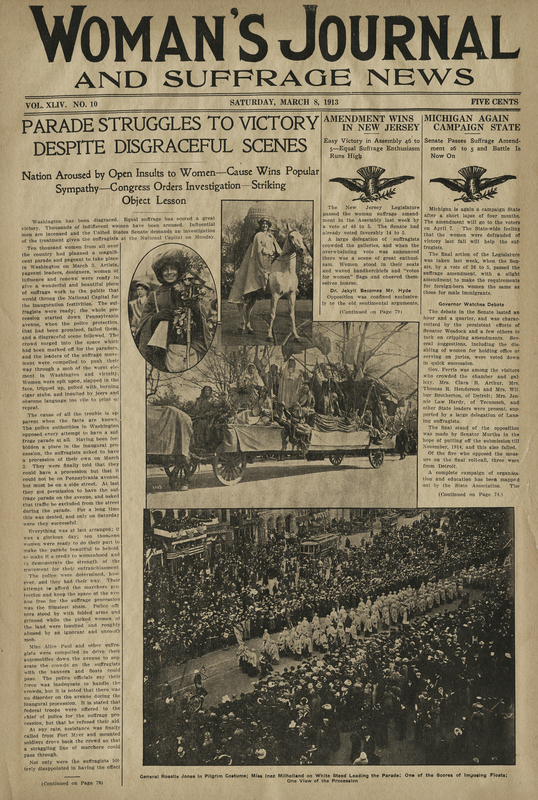 The 1913 parade in the Nation's Capital marked an important step forward in the struggle for women's rights. "Equal suffrage has scored a great victory," reported the Woman's Journal and Suffrage News. On Aug. 18, 1920, Tennessee became the 36th state to ratify the 19th Amendment to the U.S. Constitution. Seven years after the suffrage parade and 72 years after the struggle began, women in every U.S. state finally won the right to vote.